15 hrs in the city of love – what to do? To finish off our escape to Italy we had fifteen hours in Rome. “What?” was my reply. Such a big city full of thousands of years of history, culture, shopping and most importantly food! I didn’t even think it was worth coming out of the hotel room but I was wrong. These fifteen were quite possibly the best in the whole trip! Friday 5pm: arrived at hotel, got changed and were in a cab by 5:45. We did a speedy walking tour past the Spanish steps, Trevi fountain (which was being repaired – bit of a let down), the Roman Forum finishing up at the grand Colosseum. By now it was around eight, the majestic arches of the stadium where gladiators once fought lit up with purple lights. Time for us to meet up with our friends for dinner at Santorini restaurant. After getting lost in the wrong Santa Maria piazza (who knew there could be so many in one city), we sat down to dinner at nine. The four kids watched the street theatre in the square and browsed in markets calling out ‘ciao!’ to just about everyone we saw – it was our last night and we were all on a high. We went to get gelato after at a place near the restaurant. They had about forty flavours which some of the picks were raspberry sorbet, hazelnut, chocolate and coffee flavour, basil, honey and walnuts and ‘thought’ with caramelised lemon, horseradish and _____! It really does make you think… Everyone was still full of beans at 12am so we strolled through the light drizzle to our friends’ apartment where we said our farewells. The morning was a blur. Breakfast at seven and off to the airport. 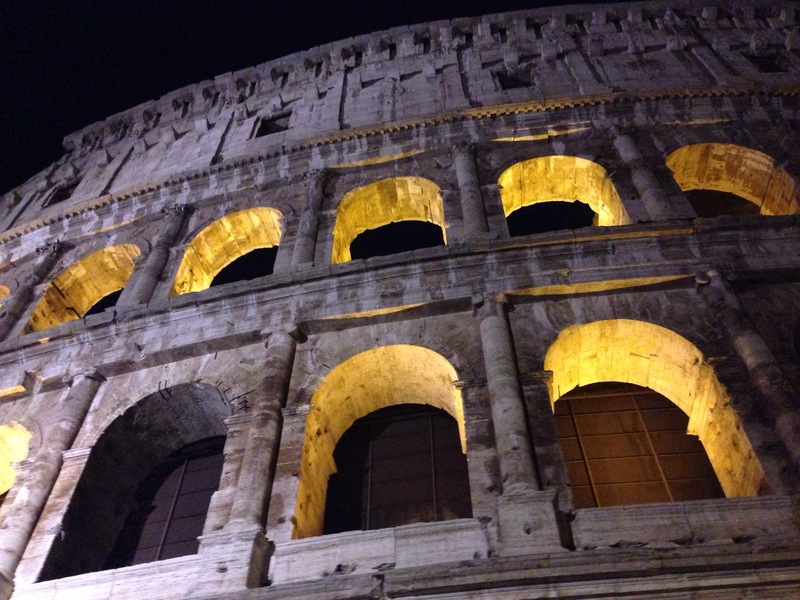 I loved Rome – the city bustle, laid back dinners and friendly locals. You can bet on it that I’ll be back there in a jiffy. It was so great to catch up with you in Rome! Hopefully many more holidays like this to come. Thanks Fiona! I hope so very much!! A gelato flavour called ‘thought’? I’ve heard of food for thought but that’s ‘thought’ for food!